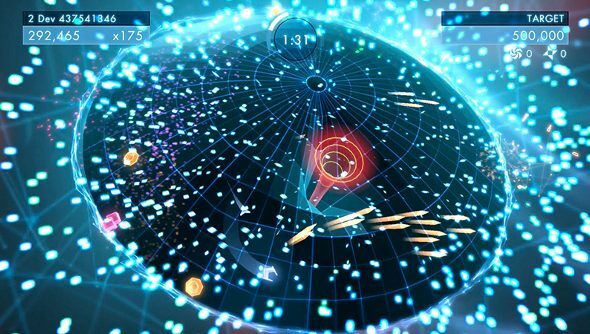 Geometry Wars is something I enjoy watching more than playing. I have the dexterity of someone with no thumbs or, indeed, hands. But all the pretty neon colours, drawing me into some sort of drug-fuelled ‘80s cyber world, and glorious digital explosions entertain me to no end. The latest installment in the twin-stick shooter series is PC-bound next month, landing on November 25th, according to publisher Activision. A couple of months ago Activision noticed that there were a few indie games knocking about and some of them were quite popular, so – after making the appropriate animal sacrifices to the Elder Gods they worship – the publisher resurrected Sierra as a new indie label. Geometry Wars 3 will be the first game launching under the label, with King’s Quest to follow. The single-player mode will be accompanied by co-op and competitive modes, so you can melt your retinas with both friends and enemies when it comes out next month.